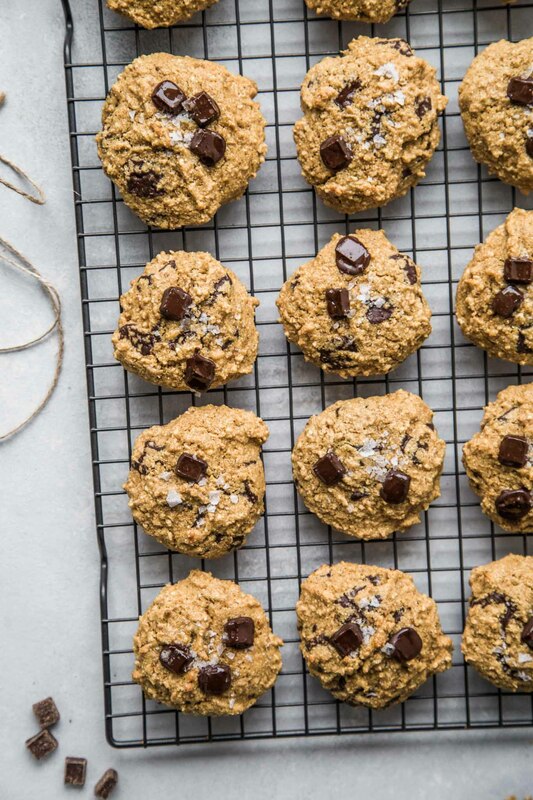 These Quinoa Breakfast Cookies with Dark Chocolate & Sea Salt are perfect for breakfasts on the go. Not only are they delicious, but they’re packed with protein, whole grains and fiber. I teamed up with the Healthy Aperture Blogger Network and Hogdson Mills to bring you this post. As always, all opinions are my own. 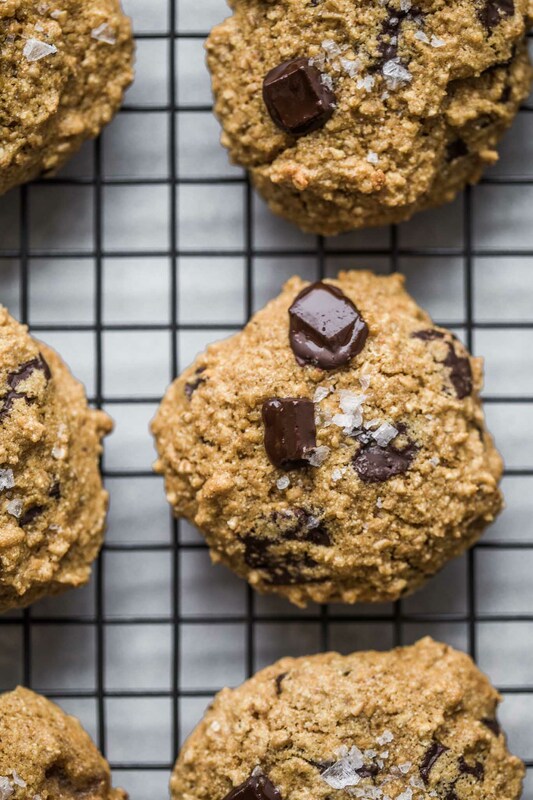 Guaranteed these Quinoa Breakfast Cookies are going to become your new morning obsession! 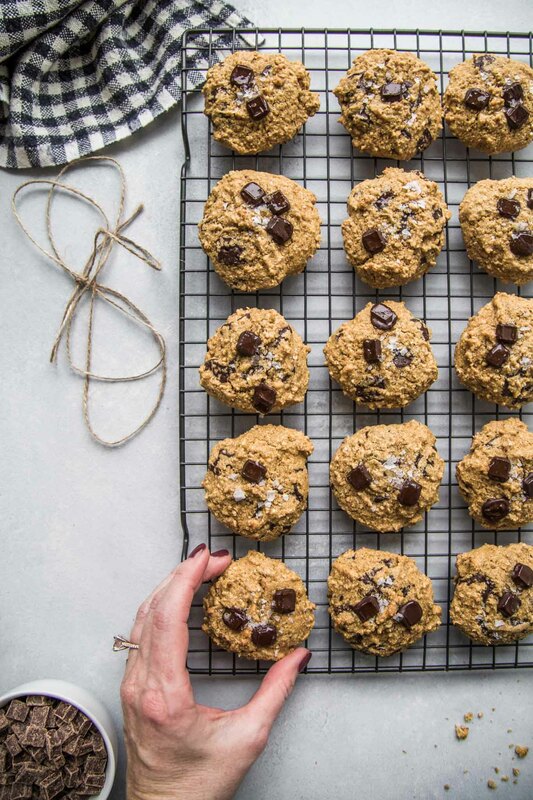 I love the fact that you can make a big batch of these quinoa cookies on the weekend and then enjoy them throughout the week. You can even stash them in the freezer for up to a month, or just bring a big batch in to work and sweeten up your coworkers. I brought in a bunch of these beauties to work a few weeks ago and I’ve already given out the recipe several times. Until I told them, no one had any idea that these were actually healthy cookies! To me, these quinoa breakfast cookies taste like a combination between a cookie and muffin. I’d say they’re a bit like a muffin top, without all the crumbliness… and they bake up right on a cookie sheet. Meaning no need for one of those specialty muffin top pans. Not only do these quinoa breakfast cookies give you an energy boost, but they’re packed with fiber and protein too. All those nutrients come from the healthy grains in these breakfast cookies – quinoa flour, steel cut oats and whole wheat flour. And all of these healthy grains come from one of my favorite producers – Hodgson Mill. The majority of people don’t get enough fiber in their diets, but it’s vital for digestive and heart health. But by substituting traditional white flour with a bit of quinoa flour and whole wheat flour, it’s an easy way to sneak in nutrition when you bake. I’ve played around with proportions quite a bit and have found that it’s easy to make this swap in any recipe by simply substituting 1/4 to 1/3 of the total flour in a recipe with whole grain or quinoa flour. Most likely, you won’t even notice the difference. 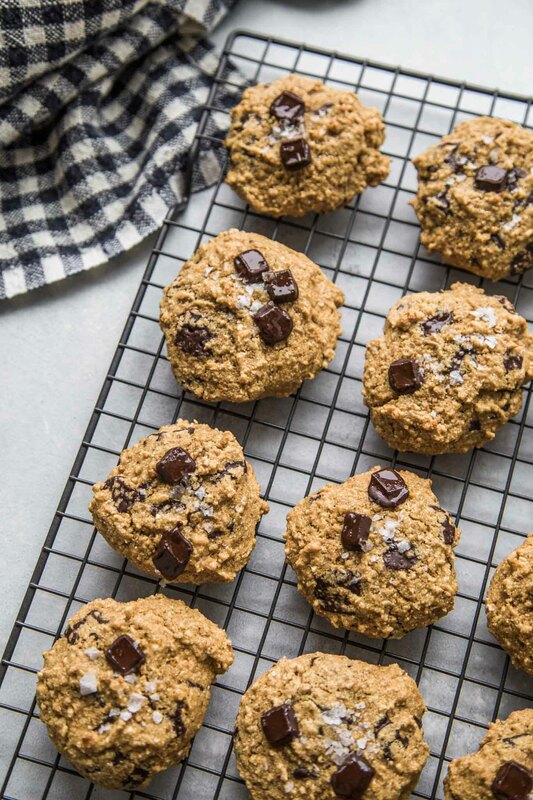 These Quinoa Breakfast Cookies with Dark Chocolate & Sea Salt are perfect for breakfasts on the go. Not only are they delicious, but they're packed with protein, whole grains and fiber. Preheat oven to 375°. Line 2 baking sheets with parchment paper. In a large bowl, whisk together flour, salt, and baking soda. Set aside. In the bowl of a stand mixer, cream together coconut oil and brown sugar until smooth. Add in the eggs, vanilla extract and applesauce and mix until combined. Slowly add the dry ingredients into liquid ingredients and mix until combined. Add the oats and mix to combine. Gently fold in the chocolate chips. Spoon dough in 1-tablespoon portions onto prepared sheets, spacing 1” apart. Bake cookies until golden, 8-10 minutes. Sprinkle with sea salt. Let cool for at least 15 minutes on the baking sheet, then transfer carefully to a cooling rack. If you loved this recipe for Quinoa Breakfast Cookies with Dark Chocolate, I would appreciate it so much if you would give it a star review! Also, be sure to snap a picture of your finished cookies and share it with me on Instagram using the hashtag #platingsandpairings. Be sure to try these Blueberry & White Chocolate Quinoa Breakfast Cookies too. 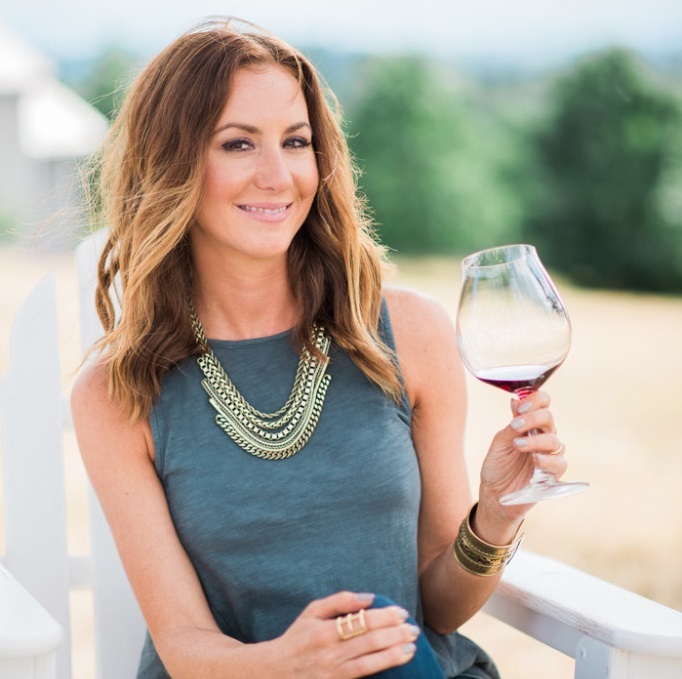 Yummm these sound delicious and right up my alley. Pinning to try later! I hope you enjoy Kelsey. I must try these out on my kids. They’d lose their mind if I served them cookies for breakfast! Totally! Mom of the Year! Who doesn’t want cookies for breakfast, right Pech? Let me know if you were able to sneak it in Mary! Fun idea! I’ve done some paleo cookies that are more like breakfast cookies than dessert but still delicious! These sound delicious. Somehow, I have managed to accumulate way too many steel cut oats, which gives me an excuse to make a batch or two asap! Of course Julia – I hope you enjoy! What a treat to have these for breakfast or a mid-morning snack! They look great. Thanks! I love eating cookies for breakfast! What would you substitute the white whole grain flour with to make these GF? Dy to try them! 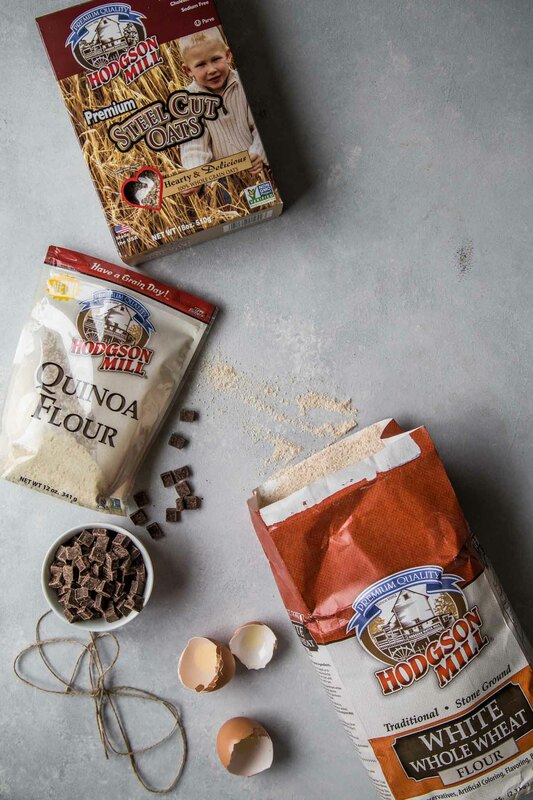 Hi Mindy – I would try out Bob’s Red Mill Gluten Free 1 to 1 Baking Flour. These are super delicious. I turned them into Lactation cookies by adding a little Brewers Yeast and flaxseed. Thanks for a great recipe. Thanks for that tip Vera! Did you use a wire rack to cook these on. I see you have them on a rack but instructions say to place on parchment paper. Maybe you did that for the pictures only? Hi Matt – I removed the cookies to that rack to cool after they finished baking. Hope that helps!